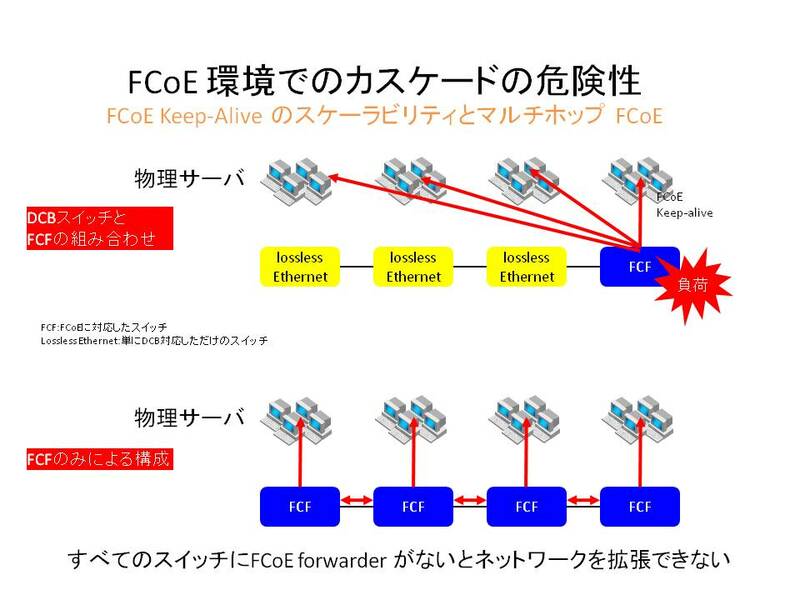 FCoE over distance がないから FCoE is dead??? So why did companies chase L2 multipath solutions? Hint: it wasn't for FCoE. It was for Virtualization! The main driver for Large, Flat Layer-2 Networks is because virtualization admins want to move VMs from one server to another, even across our vaunted routed boundaries. They don't want IP addressing decisions we made 10 years ago to influence their ability to put a workload on a server when they want and where they want. And when they do move a VM they prefer the TCP sockets stay open and the IP address not change - so they want a stateful live migration across existing L3 boundaries. The only realistic way to do this in the data center to date has been to build a Large, Flat Layer-2 Network. One thing important to point out: Neither Cisco's OTV, nor VMware's VXLAN (co-authored by Cisco's Dinesh Dutt and Arista's Ken Duda and others) support the transport of FCoE.